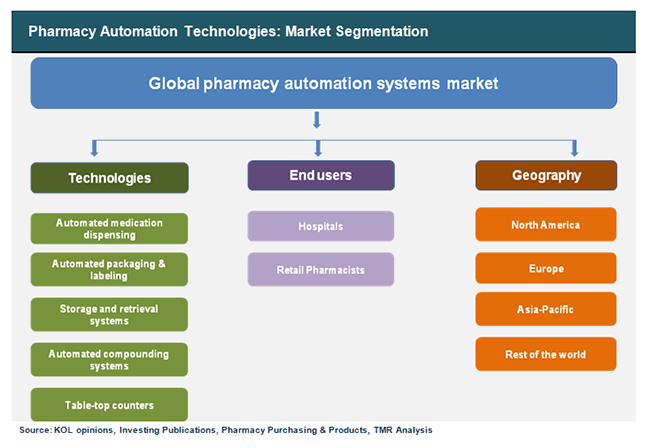 This report provides an in-depth analysis and market forecast for the global pharmacy automation market for the period 2012 – 2018. The report provides details of the several pharmacy automation devices currently available in the market along with the impact of these machines on modern pharmacies in terms of efficiency, reduction in error and speed. The report also highlights the unique connection of pharmacy automation devices with a number of other markets such as the E-prescription market and its role in the growth of pharmacy automation. The scope of the report includes competitive analysis of major market segments based on end users, technology and of different regional markets such as Europe, North America, Asia-Pacific and the rest of the world. This regional analysis concluded that most developing regions are not yet ready to accept pharmacy automation technology since affordable human skill and low currency value still provides a cheaper work force as compared to mechanization. Along with this, the cost of devices and setting them up is predicted to be another factor holding back the growth of the market. A Porter’s Five Forces analysis provides insight into industry competition and market dynamics. End-user analysis highlights in detail the opportunities for pharmacy automation in hospitals of different sizes and in retail pharmacies. It showcases the trends in hospital investment, growth of retail pharmacies and restraints of this technology in developing regions of the world. The report also highlights PESTLE factors affecting market growth. The report’s market attractiveness analysis presents a quick overview of the emerging areas which will offer sizeable opportunities to market players. The pharmacy automation systems market is currently dominated by North America which accounts for more than half of the global market share, where stringent regulations have increased the adoption of automated systems in hospitals and pharmacies. Although “Rest of the World” region currently holds a small share of the market, it is expected to grow at the fastest rate due to increasing awareness of these technologies and increasing investment in healthcare infrastructure by hospitals and retail pharmacists particularly in Middle-East.